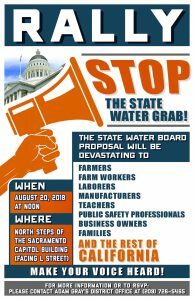 July 20, 2018 – -The State Water Resources Control Board’s decision to demand twice as much water flow down the Tuolumne, Stanislaus and Merced rivers in a purported effort to save salmon is an attack on the California agricultural industry and threatens the economic well-being of the San Joaquin Valley. Water is the life blood of our economy and farmers have made significant investments in community infrastructure, such as recycled water projects, recharging aquifers, and adopting state of the art irrigation practices to conserve this valuable natural resource. The Almond Alliance continues to fight to preserve the economic security of the Central Valley. Join Almond Alliance and Assemblyman Adam Gray as we make our industry’s voice heard, at a rally on August 20th at 12:00 pm, at the north steps of the capitol. Click here for the flyer. If you would like to see the Almond Alliance press release on this issue please click here.